In this short article, I’ll briefly present an analysis of the strengths and weaknesses of Baptist fundamentalism in 2018. This assessment is entirely my own, and it reflects my own particular experiences and education. Of course, my observations are limited by my own context — just as yours are. My remarks are meant to be broad, and certainly don’t represent every person who is a part of a particular spectrum. For example, the GARBC that exists in the Mid-West is not the same association you’ll find in the Pacific Northwest. They may share the same name and be part of the same spectrum of the fundamentalist movement, but make no mistake – they are different animals. There is also a good deal of cross-pollination, and it’d be a mistake to assume a strict delineation between the camps. But, those caveats aside, I believe the chart broadly captures the different aspects of fundamentalism. In short, fundamentalists cannot be pigeon-holed – there is a spectrum. The Movement Fundamentalists are dying. The major para-church organizations are in serious decline. Some older leadership is reluctant to hand the reigns to the younger generation. A significant minority of the membership is reactive and defensive. Its educational institutions generally straddle the fence on the common flash-points in an attempt to appeal across intra-party lines. However, I believe the movement’s base is drying up and, in the future, I suspect these institutions will have to find a way to tip-toe more towards the Calvinistic or Fundigelical camp without alienating constituents. I don’t envy them. Their educational institutions are first-rate; especially MBU! The KJVO group seems to be holding steady. Its “Village-like” atmosphere and isolationist sub-culture help ensure it isn’t hemorrhaging members like the Movement Fundamentalists are. It’s generally characterized by a militant KJVO-stance (in various flavors), a passionate anti-Calvinism, a Keswick-ish sanctification, different flavors of Landmarkism, shallow doctrine, and some trend toward conspiracy theories. The Fundigelicals and the Calvinistic groups are gaining members, and a good deal of this is transfer growth from the other two camps. These transfer constituents are often either fleeing from some perceived (or actual) legalism into the arms of the Fundigelicals, or running from doctrinal vacuousness into the loving embrace of the Calvinistic Fundamentalists. Systematic Doctrine. Fundamentalism generally does an excellent job teaching systematic doctrine. Evangelical institutions are notorious for de-emphasizing doctrine (intentionally or otherwise) in favor of a “Gospel center.” The best fundamentalist institutions strive for a balanced education, where the student explores doctrine and is encouraged to ask questions and be challenged out of his comfort zone. Fundamentalist institutions provide a world-class education, and those who have graduate training from quality institutions (e.g. Faith, BBS, MBS, Central, Detroit, etc.) are generally much better prepared than their evangelical counterparts. KJVO fundamentalism is (often) one exception to this otherwise worthy record. Separation. Fundamentalism puts proper focus on ecclesiastical and personal separation. This is a doctrine all but ignored by evangelicals. God’s people should want to avoid ungodly activities, and should encourage others to do the same. In addition, we ought to do the same in a corporate context, in our churches. Fundamentalists push holy living, and Christians across this land are the better for it. Ecclesiology. Polity is an oft-neglected doctrine today. In a world of confusion, skinny jeans, strobe lights, fog machines and sappy FaceBook Live videos, Baptist polity comes to the rescue. Fundamentalist institutions put right and proper emphasis on polity, and how we ought to “do church.” Fundamentalists want to do God’s work, God’s way. Commitment to the Bible. Fundamentalists are people of the Book. No matter where you go in this movement (with the exception of Cultic Fundamentalists), you will likely hear the Bible opened and proclaimed with accuracy and passion. Strong men. Fundamentalists aren’t wilting flowers. They generally produce strong men, who know what they believe and why they believe it. Fundamentalists are anxious to defend the faith, and aren’t shy about standing for the truth of the Gospel. This is increasingly uncommon in an age where popular culture encourages laziness and idleness, shames young men who want to act like men, and promotes a weak and effeminate model of manhood, character and leadership. The movement has some significant handicaps, none of which are new. Echo Chamber. Historically, fundamentalists have trended towards a more imperialstyle of leadership, which always tends to shut out constructive criticism and encourage sycophants. To an unusual degree, some fundamentalist institutions and para-church organizations are hampered by an echo chamber atmosphere, and leadership may have lost touch with the real world that Christians operate in every day. Thus, their strategic decisions may make little sense to outsiders (or, perhaps, to anybody else); especially to fundamentalists outside their particular camp. Critical Spirit. Fundamentalists have always struggled with how to balance love with a passion for the truth. Some fundamentalists, particularly those in the Movement and KJVO camps, continue to struggle to an unusual degree with this problem. In this respect, the echo chamber context can coalesce with a critical spirit and produce disaster. In some cases, the leadership will not understand why “outsiders” (both within and without fundamentalism) are outraged by some of their more inappropriate criticisms. Indoctrination, not Education. This observation may seem arbitrary; didn’t I just praise fundamentalism for the superior education it produces!? My response is this; it depends on your church and where you went to school. Some churches don’t encourage systematic doctrine or deep Bible study. Members may understand they “shouldn’t ask questions.” Hobby horses may be regularly trumpeted. Questionable theological positions may be uncritically accepted as “Gospel truth,” even if they’re simplistic or wrong. To the extent an educational institution employs these tactics (which are often found in KJVO fundamentalism), it is not worthy of the name. Imbalanced. Fundamentalism can be a very imbalanced movement. Some flavors of the movement spend an inordinate amount of time discussing music, dress, alcohol, Bible versions, Calvinism, evangelicals, and dispensational eschatology. A lost sense of mission. There is a very real danger that fundamentalism has lost its original sense of mission. The movement began (in a formal sense) as a protest action against theological liberalism and revisionism in the late 19th century. There is plenty of this around in 2018, so fundamentalists have a “targetrich environment,” so to speak. However, today many fundamentalists focus their energies and efforts combatting the errors of “neo-evangelicals (an anachronistic term) from 70 years ago. In many quarters, the enemy is not theological liberalism and revisionism; it’s conservative evangelicals. To the extent fundamentalist churches, institutions and para-church organizations make this mistake, they have lost their sense of mission and are adrift without purpose or destination. Strong leaders are often very certain about what they believe, and have very settled ideas about where an organization or movement needs to go. Thus, an echo chamber can result, where weaker men often just tell the leaders what they want to hear, or are reluctant to push back on bad decisions. Strong leaders have definite ideas about doctrine, often forged through personal trials and intensive theological study. This desire to help younger men avoid error can produce an educational climate, in churches and universities, more akin to indoctrination than education. For the future, I see the continued collapse of Movement Fundamentalism into either the Fundigelical or Calvinistic camps. Its institutions will slowly ease their way towards one camp or the other as the years go by, and the end draws nigh. The Fundigelicals may eventually be completely absorbed into conservative evangelicalism and not be recognizable as “fundamentalists” any longer. In some quarters, this transformation is complete in the Pacific Northwest. The Calvinistic folks will continue to produce perhaps the best trained and best equipped fundamentalists, who will have a profound influence on the movement in the decades to come. The KJVO group will never go away, and will largely maintain its status quo. Baptist fundamentalism, in its healthiest forms, offers a Biblical and substantive vision of the Christian life. Its best churches emphasize systematic doctrine, expository preaching, evangelism and progressive growth in Christ. Its best educational institutions, such as MBU, BJU, Detroit, Central, Faith and BBS, train men and women to think deeply, and provide a solid and sure foundation for the Christian life. Its ministers with graduate training are the best trained and equipped Pastors in America. The movement deserves to continue, but its future may be imbibed in a philosophy of ministry, instead of a formal “movement.” I pray the Lord raises up younger men who have the vision, force of personality, and leadership abilities to take the whole movement (well, almost all the movement) forward to accomplish great things for His Name. Perhaps your descriptions of Soteriology, Separation and Sanctification for Reformed are not descriptive enough; there are some wide varieties of those items within those who call themselves "Reformed." Just fixed a few things. It's meant to be little more than shorthand, but I get your point. Interesting that under the Fundigelicals-e.g. GARBC, you have Gospel and social justice imbalance. What did you specifically mean by that (I don't want to read into anything) And if there is GARBC churches that somehow hold Social justice above the gospel, where are they? My experiences have been with Michigan, Ohio, and Indiana GARBC churches (many of which happen to be more in the Fundigelical camp in areas such as music or separation) but never have seen a GARBC church that somehow held Social Justice above or even equal with the gospel. Is that a Northwest thing? Interesting, helpful, and I think mostly accurate. Baptists who believe in eternal security usually do not answer to Arminian. It is a term reserved for those who believe in apostacy or losing your salvation. Connect316 and SBC Today do not use the term Arminian of themselves, though they are not five-point Calvinists. The terms usually preferred are Traditionalist, Non-Calvinist, or Moderate Calvinist. I know a couple of those terms can contradict, according to how they are defined. “None of the authors in this project is Arminian or a defender of Arminianism. None of the authors is a five-point Arminian, a Pelagian, a semi-Pelagian, or a strong Calvinist.” -Whosoever Will: a Biblical-Theological Critique of Five-Point Calvinism, B&H Academic, edited by David L. Allen and Steve W. Lemke. Contributing authors: Paige Patterson, Richard Land, Kenneth D. Keathley, Kevin D. Kennedy, Malcolm B. Yarnell III, R. Alan Streett, Jeremy A. Evans, Bruce A. Little. This may be a Northwest thing. It's just something I've observed from some folks up here. This is the great danger with generalizations. But, to be sure, the GARBC in the Midwest is completely different than up here. I suspect this is because there are no fundamentalist seminaries up here, and the result is that the emerging leaders are basically evangelicals who often have little to no polity to speak of, and minimize separation. That, coupled with the overtly secular culture up here, can produce a social justice imbalance. I've seen a few troubling things. I didn't mean Arminian as a slur. I understand what Arminians believe. I understand the desire to avoid pigeon-holing yourself with a soteriological label, but "Arminian" does fit a great deal of the "movement fundamentalists." There is a deliberate distancing from Reformed soteriology, a pre-mature appeal to "mystery" for how to balance sovereignty and free will, and a run to prevenient grace as an answer. Perhaps I could have labeled it "incoherent flavors of Arminian soteriology." I'll probably modify the chart later this evening to address your concerns. "Incoherent" is much better! :-). How about this: "inconsistent flavors of some Arminian soteriology." Interesting statement, seeing as how I'm pretty sure no one has unlocked that very thing, no matter how exhaustively it has been attempted. It is beyond our understanding, therefore it really is a "mystery," isn't it? As an aside, I found Bauder's Nick of Time from this past Friday an absolutely fascinating philosophical discussion on the subject of "free will." Good food for thought, even if it does not and, indeed, will not answer that fundamental question. Mystery is fine, as long as you wait to play the card until you deal with what the entire Bible actually says. Connect316 and SBC Today do not use the term Arminian of themselves, though they are not five-point Calvinists. "Moderate" as a descriptor for Calvinism may have first appeared in Geisler's "Chosen But Free," but is not a REAL descriptor. If one only holds to the P, and affirms the Arminian view of the the TULI, they should not be ashamed to call themselves Arminian. A NON-C is an Arminian, as is a TRAD, even though most of them profess loudly that they are not. Personally, I never heard of Arminianism until I was in my late 40's, although I had heard and read about how incorrect Calvinism was. I didn't realize how ignorant I was, and it was my study of Romans that proved to me that I actually was a Calvinist. No doubt there are others like myself that if they heard a correct representation of C, would find out that they too are C's. OK, let’s turn this around. Hyper-Calvinists agree with all five points of Calvinism. Therefore, it’s alright to call all Calvinists by the name, Hyper-Calvinist (after all, there are obvious similarities). Or, at least, say they lean toward Hyper-Calvinism. I think most all Calvinists or Reformed would disagree with this terminology (and I don’t blame them). In many people’s minds, it is just as unfair to call Traditionalists (aka Moderate Calvinists, Non-Calvinists) by the name Arminian. To a Baptist, Arminian is a perjorative term. 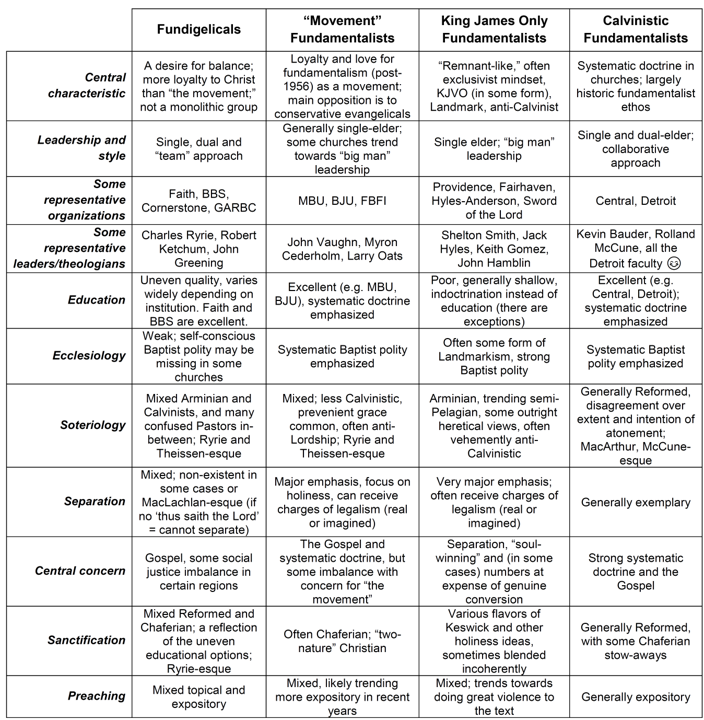 I hope folks look beyond the chart, towards my comments on the strengths and weaknesses of modern Baptist fundamentalism. I ended the article by saying some very positive things about the movement. Isn't the big disagreement with the term "Arminian" the question of whether or not one believes he can lose his salvation? That's a big deal and is a game-changer on whether or not I would agree with a church position. A church can be non-5 pointer Calvinist and still believe in eternal security, can't it? What does one call a non-5 pointer who still believes in eternal security (vice a true Arminianist who believes salvation can be lost)? Anyone who wants to read what Arminians believe should read Olson's book Arminian Theology - Myths and Realities. The ACCC are not Baptists. Good one; not sure why I did that. I'll fix it this evening. I found this to be an excellent article. I grow up (as a teenager on) in a "Movement Fundamentalist" church, went to a "Reformed Fundamentalist" college, then transferred and graduated from a college that ended up being between a Movement Fundamentalist" and a "Cultic Fundamentalists". The Movement Fundamentalist church that I grew up in became a Fundigelical church so we left and ended up in a church we thought was a movement fundamentalist but turned out bordering on a Cultic Fundamentalist position. I agree that the Movement Fundamentalist position is dying and that is why we are having a difficult time finding a church. Also liked your strengths and weaknesses section. Unfortunately we are not comfortable in the other 3 groups. Interesting analysis. I've saved it for future reference. You are my friend, so I'm not being antagonistic here. But, my friend, you misrepresented Faith Baptist Bible College and Seminary in Ankeny. I've taught as an adjunct professor there for several years, and I'm going back this spring. I went to school with Drs. George and Myron Houghton. I preached for Dr. Tillotson when he was in Canada. That institution and those men are anything but "fundagelical." They are solid Baptists, separatists, and dispensationalists. I was worried about objections from the Faith crowd. In the footnote, I make a remark along those lines about Faith. I also mention Faith in the article, twice, and say they're one example of the best education fundamentalism has to offer. My experience is that, in general, the GARBC-ish schools offer an uneven education. In the Pacific Northwest, Corban and Multnomah are where guys go. They cannot compete with Faith, BBS or any other fundamentalist institution. By uneven, I mean you can't depend on a prototypical graduate. You know what you get with an FBFI-type guy - he'll be a grad from MBU or BJU. The same with the more Reformed-ish folks. With the GARBC, you never know - it depends to a large extent on the school. The quality will vary depending on the institution. In the Midwest, the GARBC crowd certainly isn't fundigelical. In the PNW, they aren't even fundamentalists (by and large). It depends where you are. That goes back to my original point of unevenness. It's a loose association, and the regional associations may bear little resemblance in philosophy and practice to the national platform, no matter what the doctrinal statements say. Again, I point to the PNW. I think most people would agree the GARBC is to the left of the FBFI on separation, and more open to a Reformed-ish soteriology (and I say, "Amen" to all that, with some caveats). However, once you get out of the MidWest (the GARBC's home and still its stronghold), you find wide divergence in philosophy and practice. I'll update the chart this evening to better reflect my reasoning. As a non-Baptist (but really Bible churches tend to be incognito Baptists), I appreciated that you did not confuse the term "fundamentalist" with "independent Baptist." The cultic independent Baptists out here think they own the term "fundamentalist." They might even argue that the Fundigelicals and Reformed-leaning are not fundamentalists at all. As far as the quick claim that God's sovereignty and man's responsibility (I shy away from "free will") are a paradox is significant. I agree with you, Tyler. When you clearly, slowly, and thoroughly teach unconditional election and irresistible grace -- and then discuss how it is a paradox in light of responsibility, that is a good thing. But when you use the idea of a paradox to EVADE the issue and downplay divine election, that is not right, IMO. It is that quickness, that ready-to-jump to the word "paradox" that troubles me. It is like calling for technical support and instead of helping you, they try to sell you another product or service instead of helping you. The bottom line is that some people want to pay lip-service to doctrines like unconditional election or irresistible grace, but do not want those doctrines to have any practical effect. They want to think and act as though those doctrines (and their obvious implications) do not exist. I have a lot of problems with quickly evading the issue in the name of paradox. Giving adequate airplay to unappealing truths is more honest, IMO. Its interesting in the Midwest within the GARBC because here is Western Michigan, Cornerstone U and Grand Rapids Theological Seminary have alot of influence and they have moved solidly in the conservative evangelical camp. Their view of ecclesiastical separation is very much along the lines of a Moody Bible Institute (probably because Joe Stowell is the president). Yet there is a much more reformed feel to them and the gospel is central to everything. Since many GARBC folks in Western Michigan have rubbed shoulders with Kevin DeYoung (his church is in Lansing MI) through conferences and read his book (What is the Mission of the Church), their view of social justice is more of an implication of the gospel rather than part of the gospel. When a church makes social justice a part of the gospel, often times there becomes a haziness of what the gospel really is. In Indiana (and even some Ohio) GARBC churches, I have found the uniting point to be the Nouthetic counseling because of the strong influence of Faith Baptist Church of Lafayette. The convergence of fundamental GARBC churches and conservative evangelicals take place because of their strong views about Biblical counseling and separation seems to often happen along those line rather than a philosophy of worship. With any taxonomy its difficult to nail it completely down accurately beause you have to rely on some generalizations but I think you did pretty well with the Fundigelicals and the GARBC. I thought the ACCC was an umbrella organization that includes Baptists, along with other denominations. Am I mistaken? Bro. Barkman: You're right about the ACCC; I have no idea why I included them on the list. Terrible oversight. I'll fix it this evening. Joel: I'm going to fix the chart, and add some more info for educational institutions across the board. The GARBC is a very odd animal; it's so different in so many places. It's not monolithic. I need to tweak the chart a bit, but I expected that! Greg, you are right, but they can't properly be called Baptists because there are many other groups involved. The current president, a good friend of mine, Dan Greenfield, pastors an Ohio Bible Fellowship church. I would guess he is fairly close to Baptist in many ways, but the organization as a whole is not a Baptist organization. Another friend was I think president in recent years, John McKnight, an evangelical Calvinistic Methodist. Joel, living less than an hour from Faith Baptist, I concur that it's influence is great. Interesting that even Southern Seminary seems to be going the Nouthetic Counseling route (I personally do not agree with that philosophy of counseling, so I am certainly not endorsing it). The local GARB church in my city has a nouthetic counseling ministry, using laymen as counselors. Faith's influence is strong. Having been in the same location for nearly 35 years, I have seen both of these churches very much change their philosophy of church music and a host of other things (like 180 degrees). I thought they needed to do this 35 years ago (I've always advocated contemporary Christian music mixed with hymns, now known as "blended"). That noted/asked, it strikes me that if the main source of growth among "fundigelicals" (as Tyler describes them) is defection from other portions of fundamentalism, they are in almost as much trouble as movement, cultic, and Reformed-ish fundamentalists. Or, shall I say, "we", as I'm somewhere between that and Reformed-ish. Bert, my own observation is that younger fundamentalists are fleeing to the Fundigelicals or the more Reformed-ish folks. Going forward, I'm not certain the GARBC will be able to retain an identity distinct from conservative evangelicals. I'm also not sure it wants to. Tyler - if you are correct, and the "cultic" fundamentalists are holding their own, then those fundamentalists who are switching camps must come predominantly from the "Movement" fundamentalists, no? Do you see this dynamic just with pastors/church leaders or with laity as well?